The Irish Government, in an attempt to help revitalize their economy, has set aside 500,000 euros to act as a competitive start-up fund for 10 internet and games-related businesses. The fund, which is expected to increase in 2011, was recommended in a report by the Irish Innovation Task Force, which was set up in 2009 to advise the Irish Government on how to create a smarter economy. Batt O'Keeffe, the Irish Minister for Enterprise, Trade and Innovation, called games, " ... one of the fastest-growing markets in the world with an estimated value of more than €30 billion," and called the fund an investment in the future of Ireland's internet and games industry. "In Ireland and the UK, the market for online games is valued at about €2 billion," he said. "Clearly, there is an enormous business opportunity there for Irish firms and the Government ... Enterprise Ireland is focused on helping internet and games entrepreneurs to capitalise on this rapidly growing market opportunity." To facilitate the growth of Ireland's games industry, several start-ups will be provided with 10,000 euros and an experienced business mentor, to help them through one of the most difficult parts of starting a business. 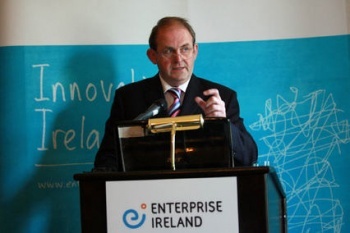 "Very early stage companies can face difficulties in raising external financing at this vital stage in the start-up and market launch process," said Frank Ryan, CEO of Enterprise Ireland. "This new Enterprise Ireland competitive start fund is aimed at helping them bridge this gap and quickly validate their market"
The 10 start-ups will be selected by the end of January, and will be selected by a panel of Ireland's top internet and games entrepreneurs.